COLUMBIA, Mo. – The Panda Charitable Foundation, led by Andrew and Peggy Cherng, University of Missouri alumni and founders, co-chairs and co-chief executive officers of the Panda Restaurant Group, Inc., has given $1.5 million to the MU Honors College. This gift will support scholarships, programs and study abroad opportunities for high-achieving students within the MU Honors College. the Cherng Conference and the Cherng Visiting Scholar program, which bring leaders who study global issues and solutions to Mizzou on an annual basis. Andrew Cherng earned a master’s degree in applied mathematics from the MU College of Arts and Science, and Peggy earned a master’s degree in computer science and a doctorate in electrical engineering from the MU College of Engineering. Under the Cherngs’ leadership, Panda Restaurant Group, which operates the Panda Express chain of restaurants, was named one of America’s best employers by Forbes and was ranked the top Asian quick-service concept for seven consecutive years by QSR. Additionally, the Cherngs have been inducted into the National Restaurant Association’s Hall of Fame. The Cherngs are deeply committed to giving back to the communities in which Panda restaurants operate through Panda Cares Foundation, a philanthropic effort that has donated millions of dollars to non-profit organizations, schools and children’s hospitals since its founding in 1999. 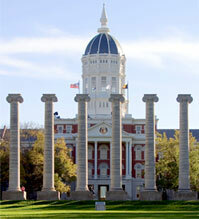 Founded in 1958, the MU Honors College has a current enrollment of more than 2,550 students and nearly 11,000 alumni. The College offers almost 200 unique courses every year and boasts an active faculty of more than 160 of MU’s most accomplished scholars. The College seeks to serve a diverse group of high-achieving students from nearly every academic discipline so that they can excel in all facets of their education. Endowment Building MU’s endowment will allow the university to strengthen its ability to attract and retain stellar students and faculty. Signature centers and institutes These centers and institutes will be the engine of research growth that will enhance MU’s AAU status and add to the university’s distinctiveness. Campus renaissance Spurred by new and renovated facilities, Mizzou will take global leadership in education and research, which will help attract and retain students and faculty.